From the Ice Cream Sandwich Heavens comes Cool Haus. A shiny silver box on wheels has delivered the most interesting ice cream sandwiches. Cool Haus Ice Cream Truck gives options and who doesn't love options when it comes to ice cream. First step, choose a cookie, second step choose your ice cream and third step choose the top cookie. Yes ladies and gents you can have one cookie on the bottom and a different cookie on top. While I haven't had everything, I can tell you the dark chocolate cookie is delish. The Green Tea Ice Cream is seriously the best Green Tea Ice Cream in the city. If you get to them early you'll get their edible sleeve. The sandwich comes in this white paper that is not paper to toss, but paper to eat. Lately, they are at the 30th st lot at the end of the High Line. They are waffles, they are warm and you can get them with fruit or chocolate sauce. Is there anything else to say, besides Mmmmmmm? Hands down, THE best ice cream truck NYC has ever seen. If you have to visit one food truck in NYC, make sure it is Van Leeuwen. 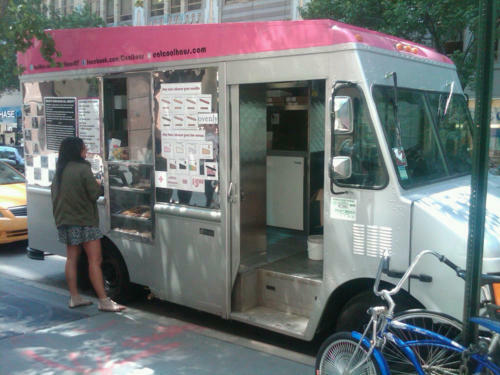 The thing that sets Cupcake Stop apart from the other cupcakes in NYC is not the fact they are mobile or they are the best cupcakes. It is the fact they have these dainty, almost miniature cupcakes. One bite cupcakes actually, okay maybe two bites. If you are craving a cupcake and don't want something so large, this is the place for you. One of the best things about The Dessert Truck is not the fact you get pastry chef quality desserts out of a truck or the fact it exists year round. The best part about The Dessert Truck is their hot chocolate. It is so good, so rich and thick. If you take it home, put it in the fridge you will have a delicious decadent chocolate mousse the next day. Two desserts in one, now who can say no to that! Log onto their site to find out where they are next.